The buses were launched from Miyapur depot here and will ferry people to the Hyderabad International Airport from various locations in the city. HYDERABAD: For the first time in the country, Telangana State Road Transport Corporation inaugurated its first fleet of 40 electric buses in the city on Tuesday. The buses were launched from Miyapur depot here and will ferry people to the Hyderabad International Airport from various locations in the city. These buses will approximately make 10 trips each day. 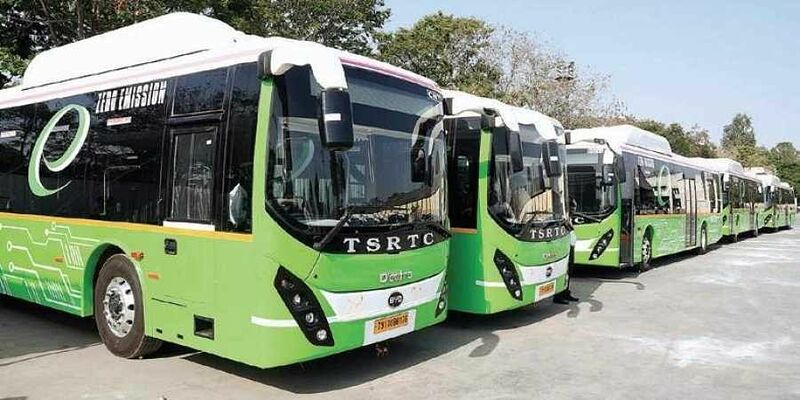 With the induction of 40 electric buses, electric vehicle manufacturer Olectra-BYD has enabled TSRTC to deploy the largest fleet of electric buses by any State Transport Utility in the country. Named eBuzz K9, the AC low floor buses will be able to accommodate 39 +1 driver. Charged to the capacity for 4 hours, the single electric bus will be able to travel more than 250 km at a stretch. Speaking on the occasion, vice-chairman and managing director of TSRTC Sunil Sharma said, “This is the first corporation in the country to operate such a huge number of buses. The agreement we have made is to set a precedence to the other States in the near future. This initiative holds a two-fold social responsibility of ensuring pollution reduction in the city as well as stabilising the corporation against the rising fuel prices,’’ he said. Olectra being the first OEM to deploy buses under GCC model under FAME-1 scheme will be seeing at opening more projects in the city. Having invested over Rs 800 crore in the business, the MEIL group of companies run Olectra has received over 300 acres of land allotted by the government to establish a world class manufacturing plant in Chandan Valley.